Going to school and making new friends can be tough. But going to school and making new friends while wearing a bulky hearing aid strapped to your chest? That requires superpowers! 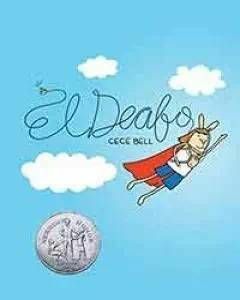 In this funny, poignant graphic novel memoir, author/illustrator Cece Bell chronicles her hearing loss at a young age and her subsequent experiences with the Phonic Ear, a very powerful-and very awkward-hearing aid. The Phonic Ear gives Cece the ability to hear-sometimes things she shouldn't-but also isolates her from her classmates. She really just wants to fit in and find a true friend, someone who appreciates her as she is. After some trouble, she is finally able to harness the power of the Phonic Ear and become "El Deafo, Listener for All." And more importantly, declare a place for herself in the world and find the friend she's longed for.